A group of prominent privacy, civil liberties, and human rights organizations have launched SecurityPledge.com, a major new campaign calling on tech companies to take concrete steps to protect their users in the wake of widely reported abuses like the harvesting and manipulation of Facebook data conducted by Cambridge Analytica. 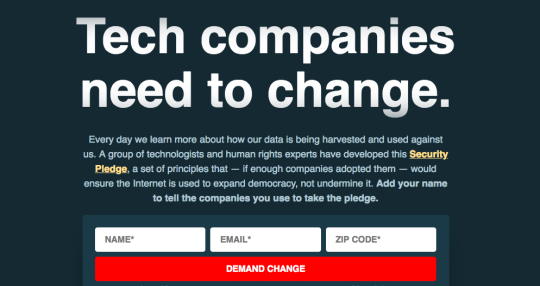 The site asks Internet users to add their name to an open letter calling on tech companies to take the data security pledge and make needed changes to ensure their users’ data isn’t used against them. The organizations behind the campaign will encourage users to flock to services that have taken these steps and avoid those that haven’t until they do.